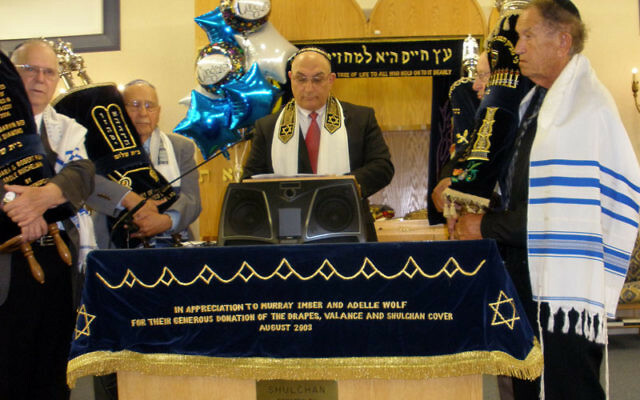 Cantor Eli Perlman leads a service celebrating the renaming of Congregation Beit Shalom, surrounded by synagogue members holding Torah scrolls. 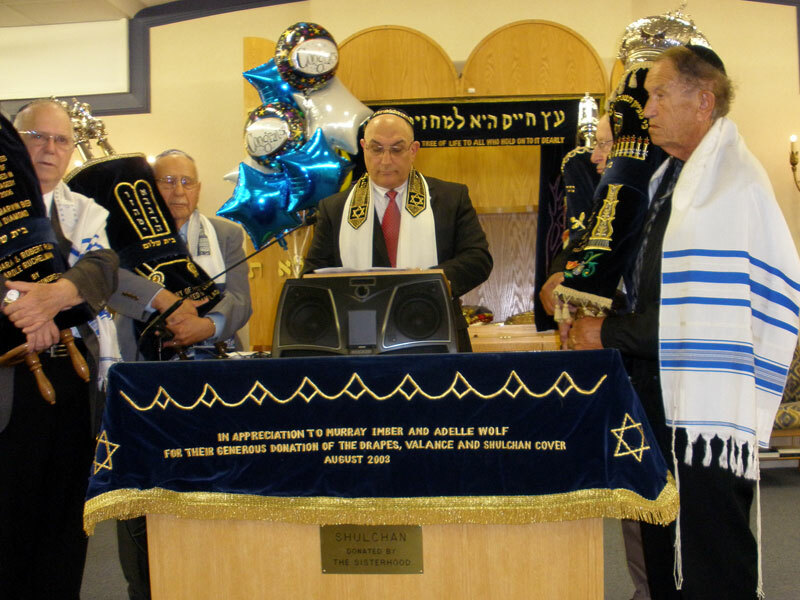 With local notables and longtime members in attendance, the former Jewish Congregation of Concordia formally changed its name to Congregation Beit Shalom in a May 22 ceremony. The event drew more than 200 to the Monroe synagogue, whose members are denominationally mixed but which affiliates with the Conservative movement. The name change was made to better reflect the makeup of the synagogue’s growing membership. Once largely consisting of residents of the Concordia adult community, where it was founded in 1984, the congregation’s membership now numbers more than 2,000 and includes residents from all of Monroe’s more than 10 adult communities. Given this, the original name, according to congregation leaders, was confusing and outdated. The synagogue officially became Beit Shalom on Jan. 1, but the ceremony was put off until May to allow members who spend the winter in warmer climates to participate. President Joan Kornblum said she had long dreamed of the congregation taking on a Hebrew name. Beit Shalom, or House of Peace, was chosen as the winner in an election among its members. In line with that, a plaque with the names of the 14 founders was also dedicated. The synagogue’s religious leader, Cantor Eli Perlman, ended the ceremony by leading Kaddish for the founders who have passed away, all but one. In the shul’s early days, Friday night services were held in Concordia’s sales office; in 1992, the growing congregation moved to the Concordia Shopping Center, and in 2003 to a larger space at the center. It now offers a variety of religious, educational, and social programs.